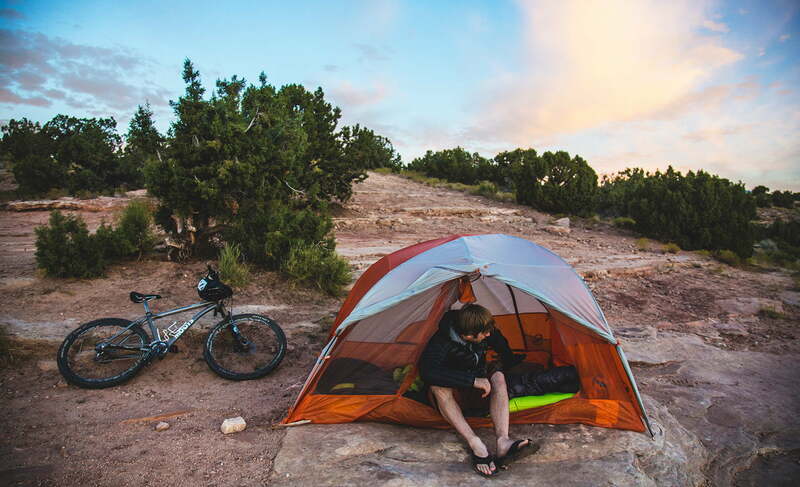 Unlike traditional car camping where the size, weight, and ease of setting up a tent are mostly non-issues, choosing a backpacking tent requires much more pre-trip planning. Not only is it crucial to shave precious weight whenever possible but you need to ensure the tent will stand up to the elements. So, before you just buy the lightest backpacking tent on the market, there are a few key aspects you’ll want to keep in mind while shopping. From the toughness of its construction material to its overall capacity, the exact type of backpacking tent you’ll need depends on where you’re taking it and who’s using it. For instance, if you’re backpacking with a partner, buying a bigger tent to sleep the two of you may seem like a smart idea — especially considering the fact you can split pack weight — but going too big can ruin the trip (for the person carrying it, at least). To help get an idea of which backpacking tent is best, we’ve sorted through the crowded marketplace to find the best backpacking tents available, and also compiled a quick list of things to remember before you purchase. Who’s it for: Backpackers who want a comfortable shelter and don’t mind carrying a few extra ounces for it. They say, “don’t fix what isn’t broken,” but Big Agnes keeps making improvements to its popular Copper Spur tent anyway. This year, the brand created even more interior space for the Copper Spur than ever before — hence the HV addition, meaning high volume. If you’re looking for that optimum balance of comfort, weight, stability, and ventilation, this tent takes the prize as one of the best three season options on the market. Its low profile, simple pole configuration, and ample guy points make for a trusty companion in strong winds while remaining lightweight at just over three pounds. Two doors and vestibules keep both parties happy, and a generous use of mesh along with a vent at the top of the rainfly allows for plenty of ventilation, even with its double-wall construction. Its free-standing design is favored by serious backpackers and makes for easy set-up and breakdown. It does come with a downside, however. When sacrificing weight, there is often a sacrifice in the durability of the fabric — and this tent is no exception. With a proprietary patterned rip-stop nylon that increases tear strength by 25 percent, it does still rank as 20-denier while the mesh ranks slightly weaker at 15-denier. This means you’ll need to treat it with care if you want it to last. Despite its slight decrease in durability, the $450 Copper Spur HV UL2 is still the easy choice as our top pick. Why should you buy this: At 2 pounds, The Nemo Hornet Elite 2P tent is ideal for fast and light trips through the backcountry. Who’s it for: Ounce-conscious backpackers who want one of the lightest two-person tents available. 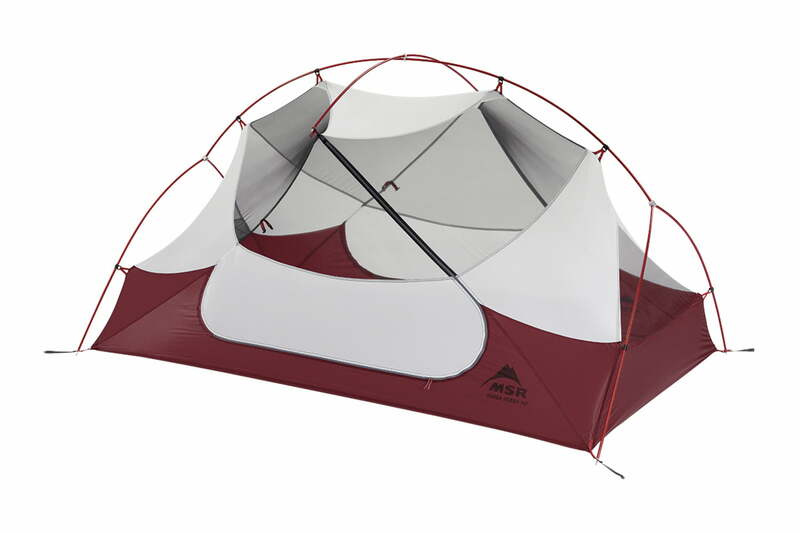 The Nemo Hornet Elite 2P is one of the lightest two-person backpacking tents available. The semi-freestanding tent has ample room for a single person and their gear and just enough space for two people who don’t mind trading some extra elbow room for ounces. To save on weight, the Hornet 2P Elite features a tapered design which reduces the interior space, but the 2019 version now has an extender at the top that adds some extra headroom. It’s comfortable, but not overly roomy. The semi-freestanding design means you’ll have to stake out one end to completely utilize the space of the interior, but it compromises by being a dedicated pole tent and not requiring the utilization of trekking poles. Two large doors make it easy to get in and out of the tent and there are two vestibules for storage. Nemo maximizes the interior with several storage pockets for your phone and other small gear. It even has a light diffusing overhead pocket that can be used with a headlamp to illuminate your tent. On the exterior, the rainfly provides “down to the ground” coverage on three sides, but comes only halfway down the tent body on one side. The tent compensates with excellent seam-sealing and a slightly raised bathroom floor, which also adds ventilation. We used the tent in torrential downpours for an entire night and stayed completely dry. The Hornet Elite does require some degree of gentleness as the lightweight 10D fabric, and no-see-um mesh may not stand up to rough handling. Be careful with this backpacking tent, and you’ll be treated to a comfortable night’s sleep even when the weather turns wet and windy. A smaller and lighter one-person version is also available for solo hikers. Why should you buy this: The Zpacks Plexamid weighs 14.8 ounces, packs down small in your pack and has plenty of room for one person and all their gear. Who’s it for: Ounce-counting backpackers who want an ultralight shelter that will last for 2000 miles. The Zpacks Plexamid is a minimalist backpacking tent that is among the lightest shelters you can purchase and still remain comfortable. On the interior, it measures 38-inches at its widest point and tapers to 28-inches at both ends. Though narrow, the tent has a peak height of 48-inches and is 7.5-feet long so most backpackers will be able to sit up comfortably or lay down to stretch their legs out. There is a single door with a vestibule for storing dirty or muddy gear that you don’t want to bring into the tent. The Plexamid is a single-layer tent with mesh for the door and a bathtub floor that is sewn directly to the rain fly. The rain fly overhangs the interior portion of the tent, allowing you to keep the doors open during a light rain. This maximizes ventilation to help reduce condensation, a problem for most single layer tents. The tent is constructed with Dyneema (formerly cuben fiber) which has a very high strength to weight ratio and is waterproof. The Plexamid won’t leak when it rains or tear when the winds start to howl. Why should you buy this: The MSR Thru-HikerMesh Tent and 70 Wing is a versatile tarp system that uses trekking poles for a fast and easy setup. Who’s it for: Ultralight backpackers who want a versatile shelter to protect them from the elements. The 12-ounce Thru-Hiker 70 wing provides ample protection from wind and rain without weighing your pack down. When fully extended, it has enough room for 2-3 people and gear. The Thru-Hiker tarp easily pitches with two trekking poles or by hanging it from nearby trees. This setup makes it very versatile. You can adjust the height of the two poles to angle the tarp, so rain rolls off or keep it very low to the ground when the winds pick up. You can extend it out to accommodate additional people or leave it at a steep pitch for warmth. Best of all, the tarp packs down compactly to fit in any nook or cranny of your pack. If you need extra protection from bugs or wet weather, you can add in the optional interior micromesh tent. The mesh tent clips inside the tarp and provides a barrier from biting insects. It also has a bathtub-style 15D nylon floor that’ll keep the wetness out when it rains. The front and sides of the insert tent are mesh, while the back is a ripstop nylon You can position the tent so the nylon faces the elements adding an extra layer of protection. Why should you buy this: The MSR Hubba Hubba NX uses a unique pole design and 30-denier nylon making it a durable and easy-pitch tent. Who’s it for: Weekend backpackers who want to make the best of a trip with a durable, comfortable tent that won’t fail when they need it the most. If you’re willing to sacrifice a bit of weight for added durability, the MSR Hubba Hubba NX is a high-quality option — and at just $400, it won’t break the bank, either. Although redesigned to weigh less than last year’s model, the Hubba Hubba NX still ranks below many of the lighter weight tents bursting onto the scene. When you’re just heading out for the weekend, however, it serves as an excellent tent choice. The Hubba Hubba NX matches the Copper Spur HV regarding floor space (at 29 square feet) and is also constructed with two doors and vestibules for comfort and plenty of gear storage. The tent has a symmetrical design, meaning both parties can sleep in either direction, unlike the Copper Spur HV and other shelters that taper in at the feet. It’s attractive to look at, and a unique all-in-one pole construction makes for one of the easiest tents to set up. Perhaps its best feature is the inclusion of a rain gutter on the tent’s fly. The 30-denier fabric makes the Hubba Hubba NX slightly more durable than the Copper Spur HV but it doesn’t do as well in storms, as it comes standard with only six stakes which aren’t enough to properly guy it out. If it’s a trip with sunshine in the forecast, MSR’s Hubba Hubba NX is your trusted backpacking tent companion. Why should you buy this: The Nemo Chogori is a rock solid four-season tent that shines when the winds howl and the snow is blowing. Who’s it for: Winter backpackers who want a bombproof shelter to weather the harsh conditions of winter. When you’re taking on the harshest weather conditions, you want a bomber tent, and the Nemo Chogori is just about as bomber as any two-person or three-person backpacking tent can get. Nemo is known for its outstanding ultralight tents, and the Chogori proves the New Hampshire-based company has the chops for the mountaineering market as well. The tent weighs just over seven pounds which may seem heavy after reading about much lighter alternatives, but when you’re trekking through snowstorms, seven pounds isn’t much for the superior weather resistance you receive. The tent fabric is carefully chosen to balance weight and strength with 20D nylon ripstop canopy, 30D SilNylon rainfly and a 70D PeU nylon floor. Its innovative design is highlighted by a single sidewall with an integrated rainfly that makes it incredibly easy to set-up. You stake out the tent and pitch the freestanding poles first before clipping up the body, then stake out the vestibules and guylines, all of which can be done in under five minutes in the midst of a snowstorm. The intersecting network of poles gives the tent its strength and the rain fly provides extra protection from sleet and snow. Although it’s one of our most expensive tents in this round-up, the Chogori is worth its weight in gold when you’re headed into the worst winter conditions. Why should you buy this: With a price tag that undercuts most of its competition, the Clip Flashlight 2 provides ample room for two people and their gear. Who’s it for: Backpackers looking for a tent that is comfortable on the trail but won’t break the bank. If you can’t afford to spend a fortune on a backpacking tent or you’re backpacking for the first time, the Sierra Designs Clip Flashlight 2 is a roomy, durable, and relatively lightweight option. The semi-freestanding tent serves as a luxurious trail companion, equipped with ample mesh for ventilation and a fly design that rolls back for improved airflow even when it is raining. The fly also can be pitched as a shade-providing awning when the sun is burning hot. Redesigned with more interior space, the latest version of this iconic two-person backpacking tent has large mesh pockets for storing knick-knacks and extra floor space for a pillow, a fleece and other small pieces of gear. There is ample headroom, especially at the front of the tent, allowing you to sit comfortably while you put on your boots or sift through your backpack. A single oversize door and spacious vestibule ensure both parties can easily exit the tent without waking up their partner or tripping over their gear. Although its weight pushes 4 pounds, the tent is still a light enough load to be split between two people on most backpacking expeditions. And with a sub-$200 price tag, the Clip Flashlight 2 is an outstanding deal. The first question to ask yourself is how many people you plan on sleeping with? Every tent in this round-up are two-person tents for simplicity, but there are plenty of great three- to four-person tents on the market — as well as single-person tents for those who prefer to go solo. Backpacking tents tend to fit sleeping pads and bags snuggly, so if you’re tall or need more room than the average person, pay attention to the interior capacity or try plus-size tent designs. Note that ultralight models are likely to be even cozier. Double wall tents are comprised of three parts: An inner body likely made of mesh with a waterproof floor, a waterproof rain fly, and poles. Freestanding tents stand up entirely on their own while self-supporting tents have poles that hold most of the body up but need other parts, such as the vestibule to be guyed out. Tunnel tents require guylines for support. Note: Keep in mind you’re likely going to want to bring a footprint which is typically sold separately. As a general rule of thumb, when you go below three pounds, you’ve crossed over into the ultralight realm. This usually equates to thinner fabrics, less interior space, and increased cost. Tarps and shelters can also be included under this umbrella. Designed for dedicated minimalists and thru-hikers, many ultralight tents are of the single wall variety and often utilize Dyneema, such as in the ZPacks Plexamid described above. Many forego poles completely and instead rely on a pair of trekking poles for set up. These are typically the most popular type of backpacking tents and are suitable for use in the spring, summer, and fall seasons. They’re capable of withstanding a good downpour or light snowfall but are not designed for harsh winter conditions. These tents need to ventilate well in summer yet be able to handle mild to moderately inclement weather. A four-season tent is what you reach for when you’re winter camping, as it’s designed to handle substantial snowfall and strong winds. These tents are typically heavier, consist of more poles, have fewer mesh panels, and a rainfly which extends all the way to the ground. They do tend to be more expensive, however. What you pay for in heavier weight you receive in added protection. The Nemo Chogori described above is an ideal four-season tent as it’s specially designed for snowfall. A fabric’s denier indicates its yarn strength, and you’ll notice that this varies considerably. Ultralight tents tend to have lower denier fabric for weight-saving purposes whereas heavier tents are likely to be more durable. The type of fabric matters, however, so be aware of differences when comparing fabrics. Deniers can vary between the tent floor, canopy, and rain fly. This is the cheapest way to attain a waterproof fabric, but the downside is its susceptibility to degradation over time — specifically a chemical process known as hydrolysis, which will eventually break down the material. Silicone elastomer coated nylons have become increasingly used in high-quality backpacking and mountaineering tents. The advantages to SilNylon are that it tends to be lighter, stronger, and more durable than PU-coated fabrics. This also equates to a higher price tag. Many tents are made of SilNylon on the outside and PU-coated on the inside so the inside can be seam-sealed by hand. Dyneema, formerly known as Cuben Fiber, is by far the strongest and lightest fabric on the market — and it’s also the most waterproof. Compared to SilNylon, which stretches considerably, Dyneema keeps its shape, which is an advantage in wet conditions because you won’t have to adjust your guylines as frequently. Dyneema can also be repaired quickly with tape and weighs less than half as much as SilNylon. While seen as an obvious advantage for utilization in backpacking tents, its major drawback is its expense.